The Kenya Gichichi Peaberry was carefully roasted for you by Topeca Coffee Roasters. This fully washed coffee was sourced from the growing region of Nyeri in Kenya and was produced by the various small holder producers at 1,200 - 2,300 meters. 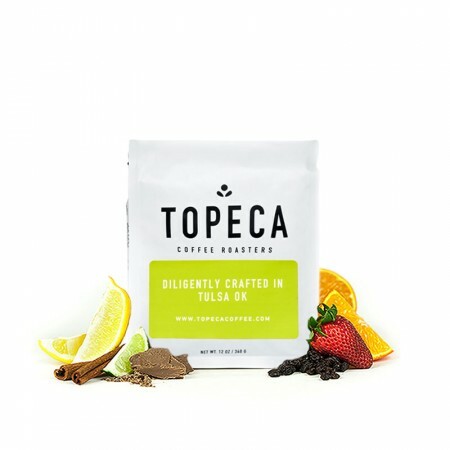 We love this coffee brewed as a pour-over, like the Kalita Wave, Chemex, or V60, to highlight its nuanced notes of black berries, tart pomegranate acidity and juicy overall quality. Bright and juicy. Best coffee I have received in a while! This coffee was incredible. The flavor notes are extremely evident every single cup. It's not too acidic, but enough to have a great flavor. Paired great with my Chemex--best coffee received thus far! Very solid cup. Really enjoyed the brightness provided in each cup. A very refreshing subtle pomegranate note made this cup pop. Would try again.